For inquiries about professional writing jobs, fine art, and illustration work (including comics), please use the Contact Page to contact J. M. DeSantis. This page is for private commissions only; prices for professional work differ greatly from those below. 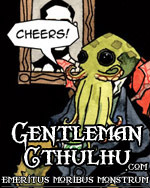 Limited space is available with J. M. DeSantis’s commitments to Chadhiyana, Gentleman Cthulhu, other projects, and his teaching job. Commissions can be mailed anywhere in the world (higher charges apply for shipping outside of the United States). Commission prices are listed below (subject to change at J. M.’s discretion). Use the contact form or e-mail link at the bottom of this page for inquiries and requests (include the word COMMISSION in your message’s title). All art commissions (as listed below) are such as typical of an artist at a comic convention. They include one character with a blank background. Black & White – An inked drawing of a single character (waist up); pencils-only are available by request (same price). Colour – A character on a flat colour background (unless otherwise commissioned; see Add-Ons). Coloured using watercolours and outlined in black pen. Fine Art – A colour commission with layered colours and textures in the background and decorated with various imagery and text associated with the character(s) depicted. Coloured inks are also used to further enhance the image. Other types of commissions are available upon request (such as acrylic paintings). Inquire below. Special pricing will apply. Small Commissions & Sketch Covers Only! 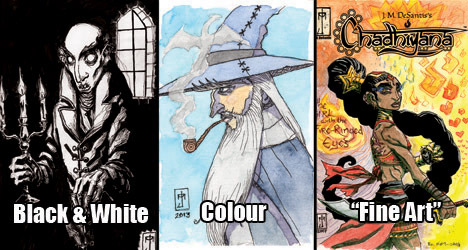 *sketch covers need longer drying times and more layers of watercolours, due to the paper types used. **not available on small 4″x6″ or 6”x9” commissions. NOTE: an additional charge of up to $20.00/piece may be added for intricate details and/or colors (at artists’s discretion, and to be discussed before payment). Writing commissions are printed on paper and may use any font of your choice. Handwritten commissions are available (see pricing below). Per 4 Lines = $10.00 (Thus: 8 line poem = $20.00; 12 line poem = $30.00; etc). When commissioning poetry, please indicate rhyme scheme (AA-BB, ABAB) or if you wish to have none at all. *NOTE: J. M. does not currently offer calligraphy as a stand-alone service! No reproductions or publications may be made using commissioned art or writing! All commissions (art and writing) are for personal use and display only; not for reproduction or publication! J. M. DeSantis reserves the right to reproduce or publish any commissioned piece, unless otherwise agreed upon, or if the subject matter of the commission is not his by origin (i.e. a commission featuring your original character will not be reproduced). 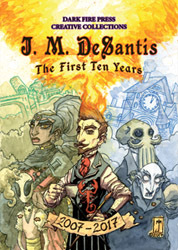 J. M. DeSantis currently accepts payment through PayPal only. Shipping charges will apply (higher costs outside of the United States). A down payment of at least half the commission price must be paid before J. M. DeSantis will begin your commission (non-refundable!). A full payment must be given before delivery of the final work. Please do not send any payment until the commission has been agreed upon and you have been placed in J. M.’s commissions schedule. Receipts available upon request. Full payment must be received before commission is mailed or delivered. By contacting J. M. DeSantis about your commission and sending payment, you hereby agree to all of the above terms. Be sure to include the word COMMISSION in your message or e-mail title (this way J. M. has an easier time finding it and your request won’t get lost in J. M.’s often overflowing mailbox).